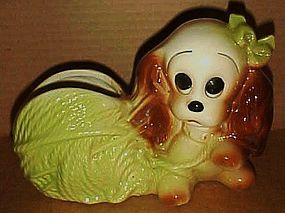 No decoration, all white glazed pottery lady planter marked USA. I have seen them listed as Hull. She measures 6" tall and is 4 1/2" wide. No chips or damages. A great decorator heavy pottery wine jug made in Roseville Ohio by Alpine Pottery.Measures 8" tall and has all decoration under glaze. 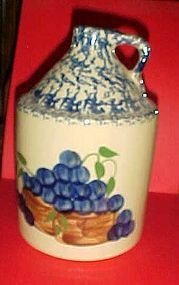 Top is blue sponge painted and the design on the front of the jug is lovely dark purple ahand painted grapes. dated 1998. Perfect condition. Needs a standard size cork. Otherwise perfect. 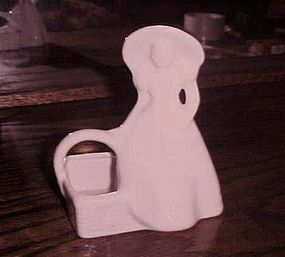 Cute for kitchen or bar. 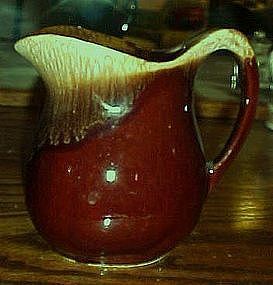 Nice USA brown drip syrup pitcher 5"
USA, small brown drip pitcher. USA embossed on the bottom, its either McCoy or Hull. No cracks or chips, excellent condition. Shiny brown with a foam drip top edge. 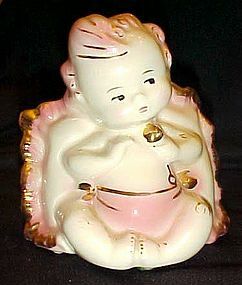 Adorable vintage nursery planter is perfect for a little girl. Pink and white with lots of nice gold trim. Her pillow has an opening in the upper back to use as a planter or a vase. Gold is in wonderful bright condition. Marked 92-USA on the back. No chips, cracks or repairs. 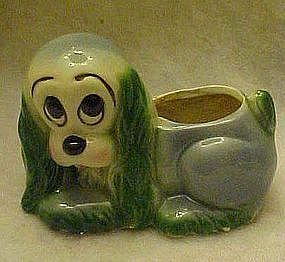 Adorable cocker spaniel dog planter most likely made by Hull but not marked. Blue / green coloring. saddest little cute face ever. Hull used this same exact face on other planters that were marked. Measures 3 1/2" tall and is 5 1/2" long. No chips or cracks. There are some glaze skips on the edge where the color is not uniform. Such a sweet vintage piece. Hull mirror brown drip pitcher 4 5/8"
Marked Hull Ovenproof USA, This has the mirror brown drip edge. There is however 2 small chips on the edge of the lip, which is not so noticeable because of the coloring of the drip.Look closely and you can see in the photo. Measures 4 5/8" tall and would be great for syrup or cream. 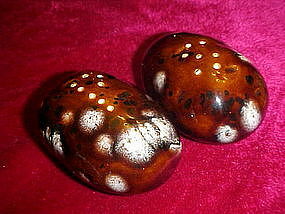 A great pair of pottery shakers possibly by Hull. There are markings on the bottom which I cannot make out. Original red rubber stoppers. S & P on the tops of each potato. Measures about 2" tall and is about 3 1/2" long. Excellent condition. No guarantee they are Hull but they are nice and would look great with Hull mirror drip dinnerware pieces. 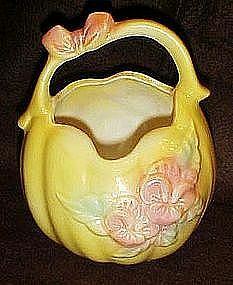 Nice old Hull sugar bowl, marked HULL USA W-28 and is the Woodland pattern. Two handles and is in perfect condition but there is no lid. Looked like a small vase to me, because there is no rim rest for a lid. (??) No chips or cracks. 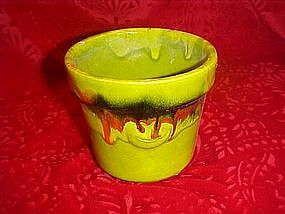 Vintage pottery flowerpot. 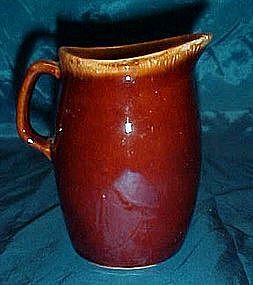 Chartruese with green,brown and red drip glaze. Marked USA 1095. Measures 3 3/4" tall. Molded ring handles on the sides. Nice heavy weight. 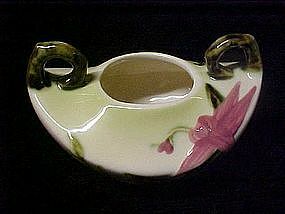 Either McCoy, Roseville or Hull pottery. There is a tiny glaze chip at the top and a hairline crack has taken off from here. Wonderful coloring. 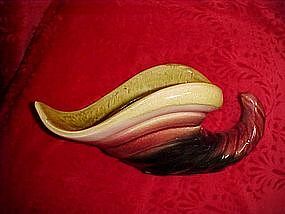 Hull USA cornucopia vase or planter. Striking colors. Graduates from dark burgundy at the tip to a avocado green drip at the opening. # 64 on the bottom Hull USA. Perfect condition. Measures 10" long. Email me for more photos.